I have officially survived day one of the actual camino which is, I’m told and hope to gawd it’s true, the most physically challenging day. 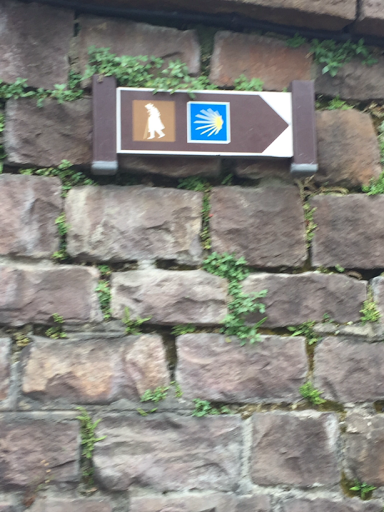 And my survival was questionable from the get-go when I attempted to depart my hotel using the back exit rather than the exit to the street, followed by turning left rather than right on the actual beginning of the Camino. Fortunately, that only took me a half a block out of the way before I realized the error of my ways (using my vast intelligence and deducing that since all the other pilgrims were heading in the opposite direction, perhaps I should, too. Once on the right path, I did quite well, although the much vaunted yellow signs were few and far between. I walked alone, even passing a few folks; since I, ahem, got a later start than most, there wasn’t a big rush hour I had to battle and I soon settled into a rhythm. It started out as a steep hike and then got steeper, still. 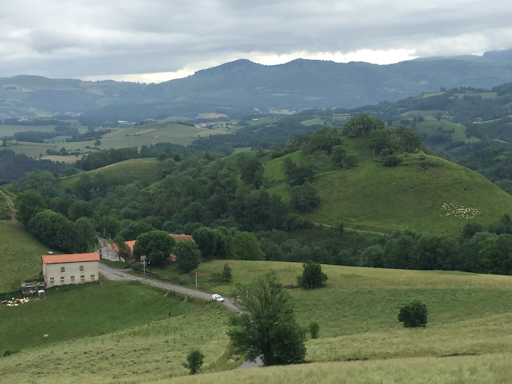 The weather was cool, cloudy and misty and the scenery was stunning: lush green fields and trees, a small mountain lane, sheeps and cows and horses free-grazing contentedly along the route. But this 2 km went on for at least 10 miles, it seemed, as the path just got steeper and narrower. I began to walk it like the Incline: take a few steps, pause for a moment, take a few steps more. I was not the only one utilizing this strategy. FINALLY, right when the mist turned into rain, the Orisson alburgue arose like a cold, damp mirage (if there can be such a thing.) I gratefully entered a steamy room filled with other pilrims, eating, drinking coca cola or beer, laughing, talking. This was at about the 7 mile marker. My Garmin watch, which lasted until just then before the battery died, informed me that, although my first six miles were in the 25-28 minute range, that last one took 37 minutes to make. I was not surprised. Were they kidding??? Did they not know how directionally impaired I was??? It was at this point that I made my most inspired decision of the day: I began frantically asking every person who I had head speak English if they were going to Roncesvalles. I struck out the first three times; they were all staying put, right there in Orisson, about ¾ of the way up the mountain. Finally, I hit pay dirt. A young woman waiting in line behind me for the one bathroom asked me in great English if I was sure someone was in there (it had been awhile, ahem.) I assured her there was. Then I asked if she was going on to Roncesvalles and she said yes!!! I asked if I could tag along, because I was afraid I’d get lost otherwise. She very graciously said yes! So we left the Orrison alburgue in the company of two young men travelling together who had joined up with Parisa earlier. And that’s where it really gets interesting. Parisa, I learned is an Iranian who has been living in Sweden for the past several years, having gone to school there and then staying for work as a chemical engineer. The two young men, John and Ryan, when they heard I was from Colorado Springs, told me they were, too! They had just graduated from USAFA the week before. I exclaimed, “I was at your graduation!” I had gone to hear President Obama speak. I walked with each of these three individually and all of us together and I have to say, I’m not sure how I could have survived the remaining steep 450 m ascent before we hit the “allegedly” flat terrain before starting down. Adding to the fun was a couple from Chicago, John and Sue, who joined in. The time went much faster than the morning spent by myself and I was very glad for the company. We reached Roncesvalles at 530 PM, 9 hours almost to the minute after I had left my hotel in the morning and having gone 25km (15.1 miles) although my trusty guidebook says it should be adjusted to 32 km to account for the extra effort and time needed over and above a flat terrain hike. Tomorrow is a mere 21.9 km (13.6 mile) jaunt on a path that begins downhill and then steadies out for the most part, before a final downhill stroll into Zubiri. It will be practically like giving my legs and lungs a holiday! Now I am ensconced in my hotel room after taking two long hot baths—one when I got here and the other after dinner—a hearty meal where I completely devoured an entire bread basket, a bowl of delicious vegetable soup and a main course of two eggs, potatoes and two (Norwegian!!) sausages—all of it washed down with some good red wine. And tomorrow, as Scarlett reminds us, is another day. The first tenet of the free person’s faith is that our ultimate dependence for being and freedom is upon a creative power and upon processes not of our own making. Our ultimate faith is not in ourselves. We find ourselves historical beings, beings living in nature and history, beings having freedom in nature and in history. The forms that nature and history take possess a given, fateful character, and yet they are also fraught with meaningful possibilities… Whatever the destiny of the planet or of the individual life, a sustaining meaning is discernible and commanding in the here and now. Anyone who denies this denies that there is anything worth taking seriously or even worth talking about. Every blade of grass, every work of art, every scientific endeavor, every striving for righteousness bears witness to this meaning. Indeed, every frustration or perversion of truth, beauty or goodness also bears this witness, as the shadow points round to the sun.